Enjoying the hustle and bustling lifestyle of Coburg! This clever designed apartment enjoys stylish finishes making the QM building a stand out from your every day apartment. 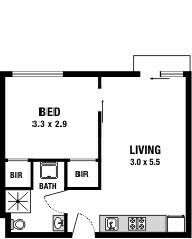 The layout includes 1 bedroom with built in robes, open plan living with Juliet balcony, kitchen with dishdraw, stainless steel appliances and polished stone bench tops, bathroom with European laundry and secure parking for one car. Located only a short stroll from Sydney road shops, cafes and public transport this residence will be a great addition to your investment portfolio potential rent return of $270 pw will make a fabulous first home. Directions: Enter via the corner of Champ Street and Sydney Road, QM Building is past the pedestrian crossing on the left hand side.